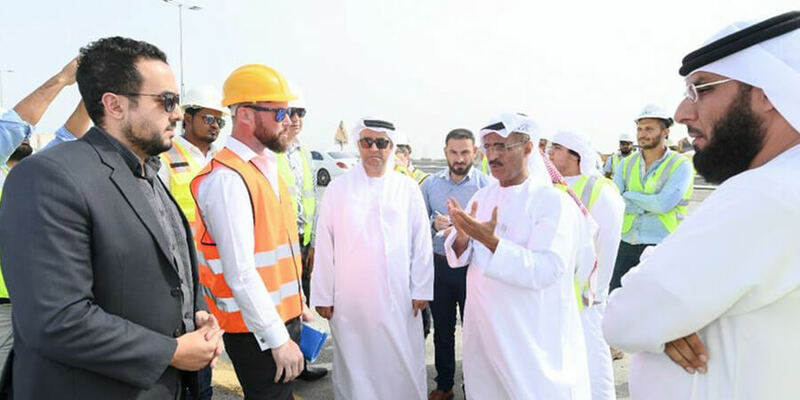 The UAE's Minister of Infrastructure Development and Minister of State for Artificial Intelligence recently met to explore the application of artificial intelligence technology in the federal roads and their field tour to the Kalba Ring Road development project, which will contribute to a reduction of 54 percent in project duration, 37 percent in fuel consumption, 80 percent in manpower dependence and 40 percent in equipment and manpower needed. His Excellency Dr. Abdullah Belhaif AlNuaimi, Minister of Infrastructure Development said the ministry is working on applying the latest technologies of infrastructure development according to the highest standards while renovating its roads construction standards. Accordingly, a number of projects enabled by artificial intelligence have been developed in cooperation with the private sector, which is in line with the UAE's vision and its strategy of artificial intelligence that was recently announced. His Excellency pointed out that using artificial intelligence for automating equipment contributes to supporting the sustainability and environment system, which is considered a main pivot of the ministry's strategy, in terms of reducing fuel consumption by 63 percent, emitted toxic gases, project waste, preventing workers' exposure to work environment hazards and maintaining occupational safety. He further stressed that the ministry's adoption of the UAE Strategy for Artificial Intelligence stems from its belief in the importance of tapping into technology to serve the infrastructure development field, and utilizing the futuristic visions that are capable of completing the advancement of the sector, as well as investing all capabilities in the best manner and utilizing available human and financial resources in a creative way that accelerates the implementation of development programs and projects to reach the future. The Minister announced the launch of the second phase of the road project connecting Sheikh Khalifa Street in Fujairah with the Khatm Melaha Customs Center and the E99 Road (Kalba Ring Road), which is approximately 7km long. Expected to be completed during the third quarter of next year 2019, the cost of the road project will reach around AED 60 million. The project consists of a two-lane highway with an island median that will allow for future development of the road by adding a third lane, in addition to a traffic signal, rainwater drainage, road lighting system and lighting poles on both sides of the road, as well as the metal barriers which play an important role in protecting and separating the two sides. His Excellency mentioned that the Kalba Ring Road project, with its first and second phases stretching to 12.5km, will contribute once complete to reducing the pressure on the internal roads of Kalba city by diverting the movement of the trucks off the city. This will increase the safety and security rates of the users and efficiency of the roads and flow of traffic and reduce the journey time by 16 minutes. It will also support the economic, commercial and tourist growth of the city and the Eastern Region in general and facilitate the movement of residents in Mohammed Bin Zayed City and the surrounding areas. The road will also strengthen the geographic link with the Sultanate of Oman by facilitating transportation and traffic to Khatm Melaha border port, which connects the UAE with the Sultanate, and is considered one of the largest land ports in the country. Minister of State for Artificial Intelligence, His Excellency Omar Bin Sultan Al Olama, said, "We are keen on cooperating and coordinating with all ministries and institutions to implement various applications of artificial intelligence. We have a huge and sophisticated package of such programs and initiatives that will interpret the country's strategy for Artificial Intelligence. The futuristic vision of our wise leaders emphasizes the leading role of our country in this field, as we have the capabilities, resources, legislation and infrastructure to qualify for such a status." He added: "We are very pleased with the application of artificial intelligence technologies on the roads with the Ministry of Infrastructure Development. These applications reduce time, effort and cost, increase security and safety levels, and facilitate for smooth traffic on the roads. They are also environmentally friendly and sustainable."